This page contains a variety of banners, graphics, tweets, emails and blurbs available (along with the code) to help you promote our various programs. Click here to login and get your affiliate URL (after you signed up above). Use your affiliate URL as described below. NOTE: Substitute the http://SocialMediaBlastOff.com URL in quotes above with your affiliate URL. IMPORTANT: Replace it in both (2) locations above. Leave the quotes in the code. More banners available in the Affiliate Center when you click Links & Tools > Banners. Tips: Use a service like bit.ly to shorten your URL to give you more room to customize the post to suit your friends and followers language. Also, try Hootsuite.com to schedule your posts ahead of time! This article is ideal for an email or blog post. IMPORTANT: When you insert your URL, it must include this addition to the end of the link: &U=www.socialmediamysterytomastery.com in order to lead them to the page where they can get the free webinar. After they opt-in for that, they will be taken to the sales page. SUBJECT: Does Social Media Really Work? are you aware what it can do for your cash flow needs? * What exactly do I do now? * What are the best strategies to implement? * What exactly is the real value of social media marketing? * How can I connect with more clients? * How do I use all these tools together? 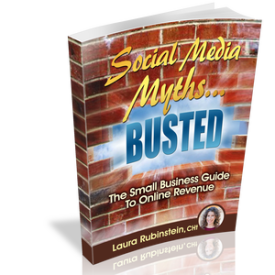 have a secret social media marketing advantage in your marketplace. tools to create a significant impact on YOUR business! your business to the next level online. Laura offers so much information and help!